Lisa Nilsson, whose Tissue Series, Angelico, Red Rug and Binding have wowed the art and design worlds in recent years, has created two new pieces. Today I am featuring Jardin... stay tuned for another equally breathtaking example of Lisa's Japanese mulberry paper and gilt-edged paper quillwork that will be highlighted in an upcoming post. 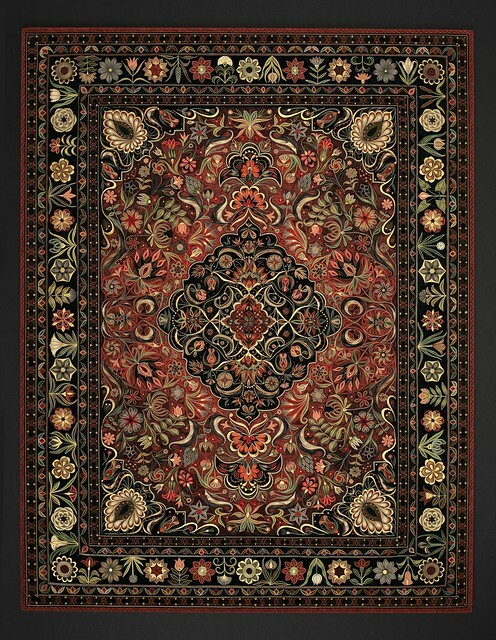 Tell us about this newest piece in your Tapis Series, Jardin. This is the most ambitious piece I've made to date. I worked on it for about eight months. 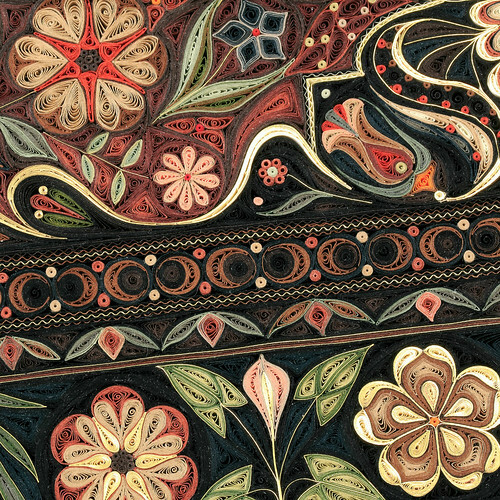 The overall color scheme and composition were inspired by an Islamic carpet. The actual individual floral forms were improvised as I worked from the center outward. 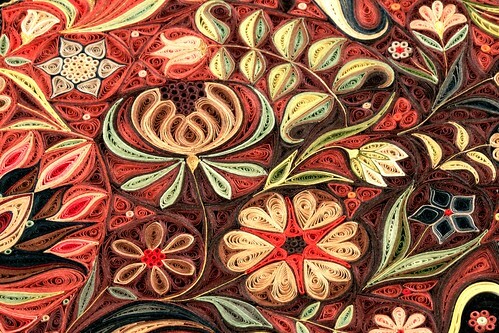 Although you use traditional quilled shapes, your work is quite unusual due to the subject matter of your designs and incredible density of repetitive elements. How did you go about creating Jardin? I liked working with the symmetry of the traditional medallion, field, corners, border composition, and especially enjoyed the necessity of making four of most of the elements. I could make a decision and then relax as I repeated the element three more times. Four seemed to be just right for my attention span. By number four I was ready to move on. As I made the second, third and fourth elements they would become more confidently made, more mature. This gives the overall piece some natural wonk effect, a pleasing irregularity inherent in the process. To make the wide border, I first made four of each of the floral elements that are seen head-on. Each silver-dollar-sized floral element, with its surrounding blue/black ground, makes a circle. When I had enough circles, I spaced them out relatively evenly and spent several days experimenting with how to fill in the hourglass-like shapes left in between. I eventually decided to fill these spaces with a flower with stem and leaves, each one different, and alternate head- in, head-out. I'm admiring the colors you chose and think the result is most definitely carpet-like. In the brick red/wine colored field I wanted to create subtle color variations that are called abrash in the carpet world. 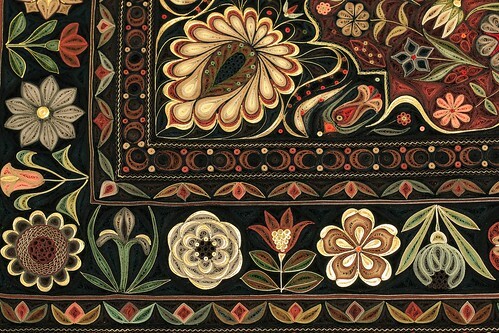 Islamic carpets are made in rows of tiny knots of yarn. Inconsistencies in spinning and dyeing the yarn create interesting watercolor-washy effects, especially visible in large areas. This effect is much more pleasing and engaging than a flat and even color would be. I varied my choice of papers concentrating the lighter, brighter reds around the central black medallion and gradually introduced deeper reds and wine colored strips as I worked outward. I didn't know until I was quite committed to the piece whether the effect would be subtle enough or too subtle. In the end I was pleased with it. Part of the challenge of the way I've been working concerns the interaction of positive and negative shapes. I insist that the quilled edge of the paper do all of the work, and that little or none of the board (that is, the board that the piece is mounted to) shows through. This means when I make a positive shape, in this case floral forms, I have to consider how to make the spaces that surround the floral forms out of interesting and pleasing shapes that are doable with pinched, coiled strips of paper. Considering the enormous number of hours spent on each one of your works, you must enjoy the process very much. In this "Tapis Series" (for the pretty French word for carpet) I've enjoyed exploring the common ground I share with the makers of the decorative objects that inspire me, as well as the the things that are unique to quilling. Unlike rug makers, I can make single elements and move them about. I don't work in rows and I am not committed to the size of a loom at the outset. Smooth curves are easily made, straight lines are possible, but require some effort. I can create variations in texture and mark by varying the sizes and shapes of the coils and groups of little cylindrical dots. I enjoy the combination of committing to some overall guiding decisions from the outset with lots of room to improvise as I work. Lisa Nilsson is represented by Pavel Zoubok Gallery. This is jaw dropping work!!! Simply mind blowing...such delicate work and hardwork..beyond imagination.. 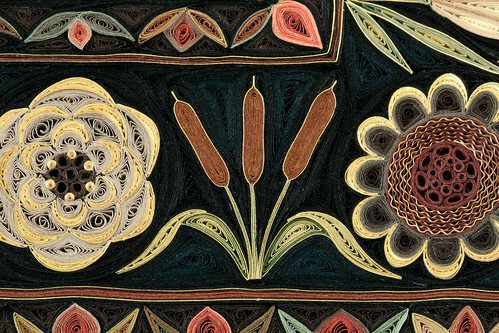 I believe this is the most amazing quill work I have ever seen. Breathtaking! This truly rates the word awesome. Gorgeous! I agree with all of you! Thanks for commenting. This work defies description as no single word is enough to convey the beauty and intricacy seen here. What an incredible talent.